Furthering its commitment to protecting educational technology while maintaining its functionality, Trident Case® today announced that it will showcase its extensive line-up of classroom solutions at EDSpaces 2015. Trident Case will exhibit its Electra® Cube Charging Cart, Kraken A.M.S series for tablets and Cyclops series for tablets at the Virco Booth #902 in the Ernest N. Morial Convention Center in New Orleans, LA on October 28-30. Trident Case's Electra Cube Charging Cart utilizes a sophisticated yet easy-to-use modular design that allows teachers and school administrators to customize their device charging solution based on requirements specific to each classroom. The Charging Cart can hold up to five Chromebooks, ten 10-inch tablets or twenty five-inch smartphones at once, and offers a unique locking mechanism to ensure stored devices are secure at all times. The Charging Cart can be stacked vertically or horizontally to fit seamlessly into any room. Additionally, the cart’s unique drawer design allows users to charge their devices without removing the protective cases. The Kraken A.M.S. series and Cyclops series are Trident’s strongest tablet cases, as they are designed to protect classroom technology from any bumps, drops or mishaps that may occur. “With these protective tablet solutions, teachers and administrators don’t have to worry about every day wear-and-tear on the valuable technology,” Achee added. “The Cyclops and Kraken A.M.S. solutions protect any school’s technology investments day in and day out." The Kraken A.M.S Clear Case, both with and without a stand, and the Cyclops Clear Case with a sliding stand are Trident’s latest classroom solutions designed to provide optimal protection. Both cases provide cushioned corners and meet the Military Standard MIL-STD-810G in both drop and vibration protection. The Kraken A.M.S. and Cyclops designs also include sealed protection covers for device controls and USB ports. Additionally, Trident’s Kraken A.M.S. Clear Cases contain over-molded shock-absorbing Thermo Plastic Elastomer (TPE) and hardened polycarbonate, a built-in screen protector along with an enhanced audio technology feature that redirects sound toward the front of the device, while the Cyclops Clear Cases include water-resistant mesh that protects speakers and vents from any dust or moisture. 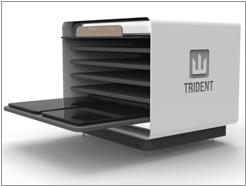 For more information on Trident’s education solutions, visit Virco Booth #902 at EDSpaces 2015 or contact sales@tridentcase.com.